I thought spending the day geocaching would be a great way to take my mind off the excitement of picking up my new house tomorrow. 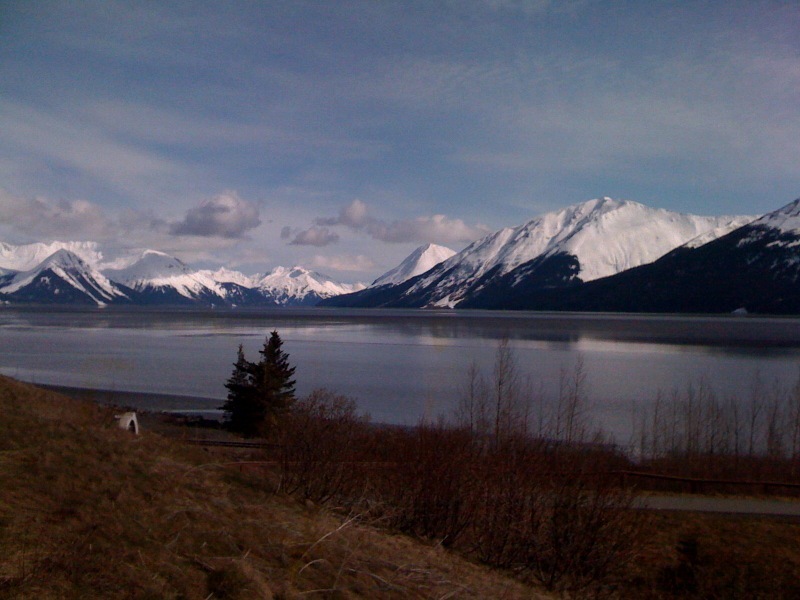 My friend (caching handle, JPuffin) and I (caching handle, Momima) had made plans to head down to Turnagain Arm with our bikes and ride from Indian Creek to Girdwood, caching along the way. I woke up at 8am to snow and 35 degree temps. Oh my, what a way to welcome in the month of May. In Alaska there is no such thing as bad weather just bad clothes, so I met my friend as planned a few hours later and we loaded up the bikes and headed south. By the time we climbed onto our bikes, the temps had risen at least 15 degrees and the sun came out in all its glory. It turned out to be a particularly stunning day on the Arm. 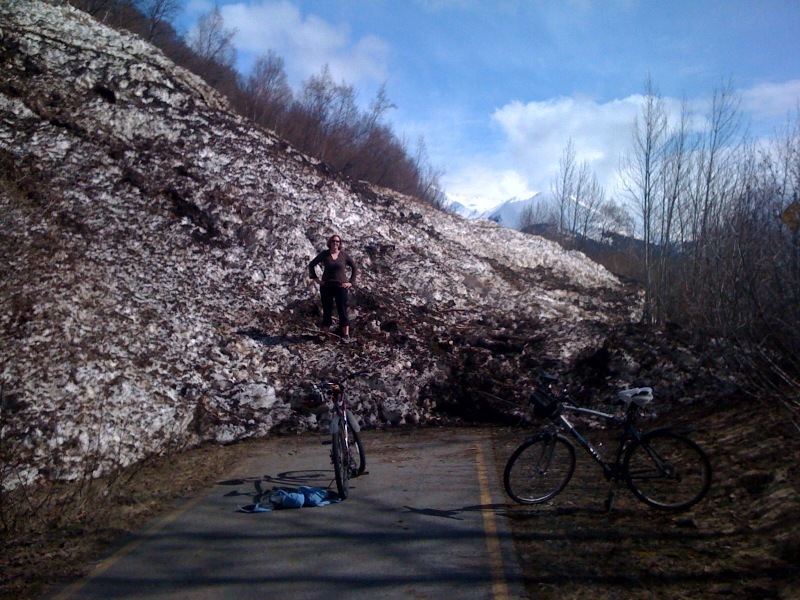 The real excitement began however, when we were riding down the bike path minding our own business when all of a sudden we see a huge, and I do mean huge, mound of snow blocking our way. It was the substantial remains of an avalanche. There was no way around it and we still had some caching to do and pizza to eat on the other side, so we just picked up our bikes and traversed the thing…Alaska style. I love your blog! And the pictures are awesome. I think you are a natural writer! Maybe one day you can turn the blog into a book; you’ll be famous. 🙂 Looking forward to all the adventures in your new house on wheels. Thanks for sharing them with us! Great pictures. I’m glad you weren’t caught up in the avalanche. The photos are a good reminder of why I love Alaska. On the right side of the edit page, you can change the posting date. I’m glad you are blogging. such fun to read and yes, the photos are awesome-look forward to lots more. You can make an iphoto book for yourself one day with all of these memories stored here.